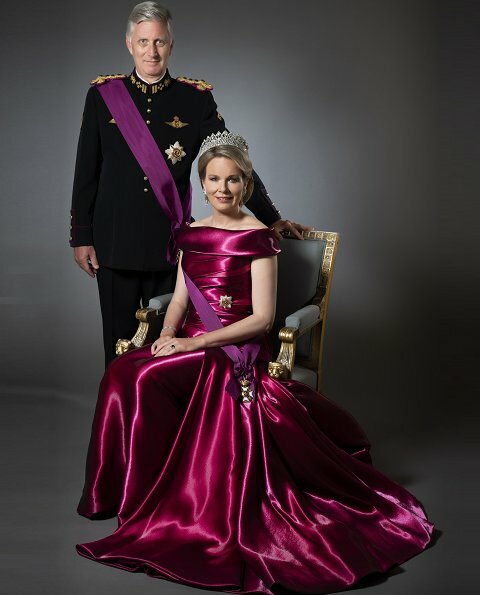 On the occasion of November 15, 2018, King's Day (Koningsdag), new official photos of Belgian King Philippe and Queen Mathilde were released. King’s Day has been celebrated in honour of the Belgian monarch since 1866, for more than 148 years. 15 November marks the first day of the Feast of Saint Leopold in the German liturgical calendar, while it is the Feast of Saint Albert in the Roman Catholic Calendar. Schöne Aufnahmen, keine Frage. Aber ich glaube, die Vorgänger-Bilder/Portraits der beiden, hätten es auch noch eine Weile getan. Ich meine, die zwei haben sich ja schließlich nicht sehr verändert. Oder muss das so sein? Oh, that is one shiny dress! 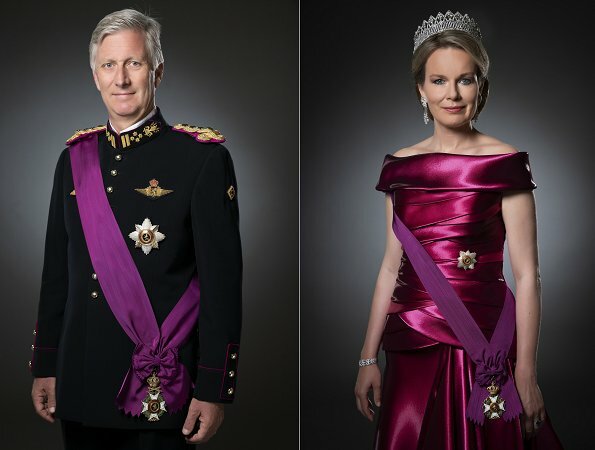 To me both the shiny dress and position of the tiara ARE ok.
De Tiara zou rechter moeten staan maar het kleed is prachtig.Wat een mooi koningskoppel hebben wij. Mathilde d'Udekem d'Acoz, koningin der Belgen, zeldzame klasse. Uniek. 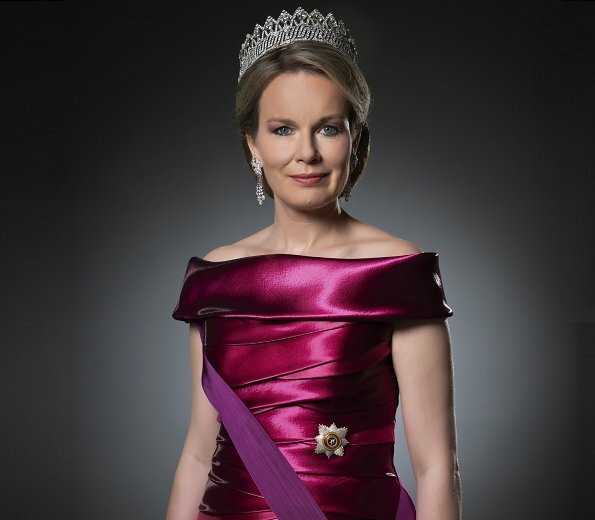 Queen Mathilde gets younger and younger, beautiful ! Philippe hat Glück , dass er so eine Frau an seiner Seite hat !! The king looks really different to his 'normal' daily appereance when I saw bigger versions of that pics. Love the portraits . Beautiful colors. What a majestic dress and tiara. The Queen looks wonderful - love this colour and the dramatic style with the draping and stunning tiara. Lovely photos of the couple. Beautiful colors of Mathilde's dress and the sashes. Unfortunate 2nd photo, either the way her skirt hangs or the shadows, looks like she's wearing long pants. Lovely dress, but, as with all her dresses, it looks way too tight on top. Tiaras are rarely on straight, and Mathilde's is no exception. Are these pictures new? Somehow they look so familiar. Did Mathilde wear that dress before? Pictures are new and yes, she did wear this dress before. They both look so regal and soft at the same time. I think that’s why I really love this royal couple, they have this absolutely kind, soft natural way about them. The most dignified and warm of them all. 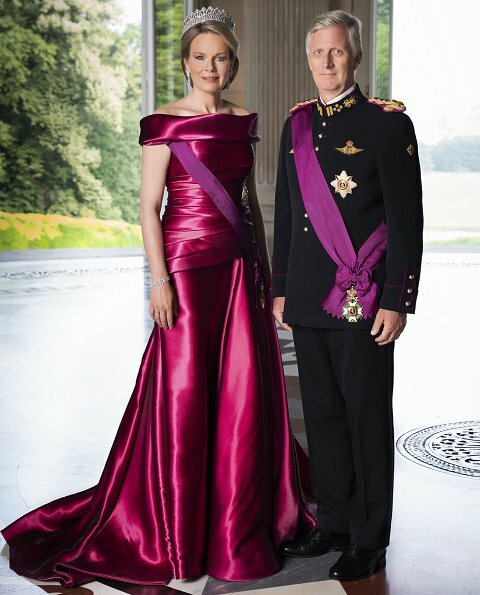 Yes, Mathilde wore this gown to Albert & Charlene's wedding reception in Monaco and then in 2015 to Queen Margrethe's 75th birthday celebration in Denmark. I read that these particular photos are from January 2017, but I don't know for sure - so don't quote me! The pictures are new but the dress isn't. She already wore it during the evening at Albert and Charlene's wedding in 2011. Eine würdige , eine schöne Königin - das Bild dass sie abgibt hat Belgien mehr als nötig ! !